The Underpants - (April 6 & 12 at 7:30 pm) written by Carl Sternheim, adapted by Steve Martin; A wild satire adapted from the classic German play about Louise and Theo Markes, a couple whose conservative existence is shattered when Louise's bloomers fall down in public. Though she pulls them up quickly, Theo thinks the incident will cost him his job as a government clerk. Louise's momentary display does not result in the feared scandal but it does attract two infatuated men, each of whom wants to rent the spare room in the Markes' home. Oblivious of their amorous objectives, Theo splits the room between them, happy to collect rent from both the foppish poet and the whiny hypochondriac. Born Yesterday - (April 5 & 11 at 7:30 pm) written by Garson Kanin; The egotistic junkman Harry Brock has come to a swanky hotel in Washington to make crooked deals with government big-wigs. He has brought with him the charming but dumb ex-chorus girl Billie, whose lack of social graces embarrasses even Harry, until Billie has enough. Vanya and Sonia and Masha and Spike (April 4 & 13 at 7:30 pm) written by Christopher Durang; Winner of the 2013 Tony Award for Best Play. Middle-aged siblings Vanya and Sonia share a home in Bucks County, PA, where they bicker and complain about the circumstances of their lives. Suddenly, their movie-star sister, Masha, swoops in with her new boy toy, Spike. Old resentments flare up, eventually leading to threats to sell the house. Also on the scene are sassy maid Cassandra, who can predict the future, and a lovely young aspiring actress named Nina, whose prettiness somewhat worries the imperious Masha. Middle Schoolin' It - (April 7 at 2:00 pm) Middle school is a time of change, filled with new people, new places and new experiences. The characters of Middle Schoolin' It navigate friendships, battle bullies, search for that first kiss, brave braces, figure out how to survive ten minutes in a closet and much more, mixing comedy with more than their share of drama. Performed on April 7. Each show will be performed once each weekend (with the exception of Middle Schooling' It will only be performed on April 7th.) 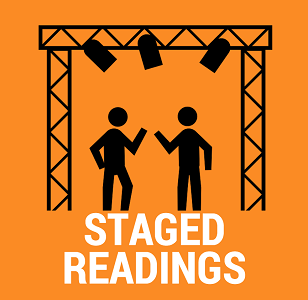 With no sets or blocking, Stage Readings allow the actors and the audience to use their own imagination to "see" the show. Each play is a full length show that will be read by the actors, along with the narration. It's a great way to spend an evening - or FOUR! Season ticket holders are eligible to see all performances with only one Flex Ticket. Non-season ticket holders can see all four shows for $30.00/$23.00 (student). You must purchase one ticket at full price. Tickets for subsequent shows will be $5.00.